I have been thinking about how to use some of my new jade beads from China. Yesterday I took a break to work out a design I have been thinking about. 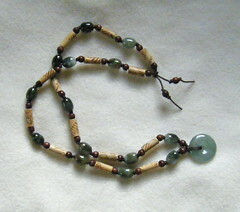 I combined jade with wooden beads; I also used some unusual beads that are made from reed, with designs printed on them. I strung the beads on brown cotton cord, using knots between the beads as part of the design. I made the necklace long enough so that I could finish it with knots and beads instead of a metal clasp. 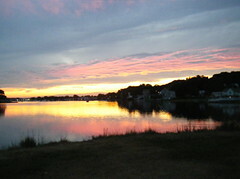 I took this photograph last night during another evening walk at Obear Park, here in Beverly, MA. I have gone there so often this summer and have taken so many photos of the sunset that yesterday I had decided to leave my camera in my purse. But when I saw the view, I couldn't resist. Some of the sunsets have been quite spectacular and dramatic, but this one was gentle, with a lovely apricot sky. These are sketches that I made for a painted pattern that I want to use for the heart-shaped box, a collage and decoupage project that I have been working on for a LONG time. Although I still have a long way to go to finish the last two decoupage surfaces, I have already been thinking about how to finish the last surface, which is the inner wall of the box lid. A few months ago, I realized that I should probably paint the that surface to avoid the wear and tear of two decoupaged surfaces moving against each other when the box is opened and closed. Well, I may change my mind about all of this, but for now, my idea is to use gold and silver acrylic paint. It was too hot today to try decoupage, and I was short on time anyway, so instead I decided to try to come up with a pattern for the inside of the lid. I used a stencil tool that came with a little drawing set, and measured to see how much room I will have and how the stencil will work. 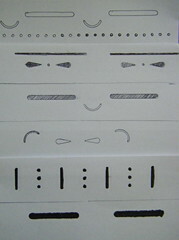 The photo shows six ideas that I came up with, done with felt-tip pen, sharpie pen, and marker. These patterns are constrained by how the stencil tool can fit inside the lid. Right now, I prefer the pattern that is shown second row from the bottom. The stencil tool was so awkward to use that I think it might actually be easier to paint it the pattern by hand. In any case, it was good to get ideas. And I am still thinking about it. To be continued. . . . This image began as snapshot given to me by one of my aunts, several years after my dad died. My dad is the boy on the right, with the dark slacks. Yesterday, I used Painter's digital airbrush to add color to the image, and then I posterized it and cropped it to get this image. I don't know if this is on a ferry boat, or just near the beach, maybe somewhere near Brooklyn. 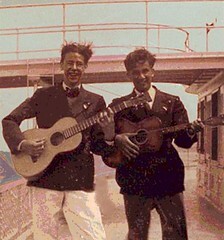 The writing on the back of the snapshot says "Hy and Eddie Cohen, 1939". Usually, I try to get permission before posting images of people, but in this case, I have no idea how to find my dad's friend. (Eddie Cohen is a very common name.) So instead, I added extra posterizing to Eddie's face, to make the image less recognizable. I briefly considered cropping and modifying the image to show only my dad, but he was friendly and generous and big on duets. When I was growing up, my dad and mom were always playing piano together, and as I studied piano, he even played duets with me. (In any duet, he was always the better musician, even though he couldn't read music.) Despite years of piano lessons, I am not a musician, not even close. But this image is a different kind of duet, a visual collaboration with the unknown photographer who took this picture. I am posting this visual duet today because my dad was born on August 28, 1918. Last night I took a couple of photographs during a walk at the Cummings Center Pond, here in Beverly, MA. 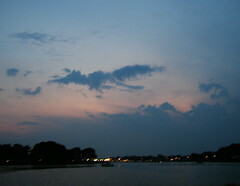 It was around 7:30 pm, and the sky was beautiful, and so was the water. Tonight I cropped one of the photos to get this composition. I wanted to emphasize the contrasting patterns of clouds, trees, water, and fence. 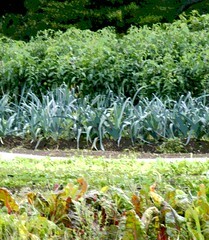 Thursday afternoons we go to Long Hill Gardens here in Beverly MA to pick up our vegetables from The Food Project, which is a Community Supported Agriculture (CSA) project. This is a lot of fun! 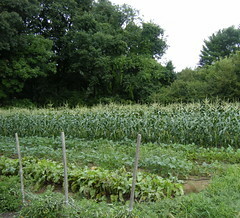 I like seeing the rows of plants in the field, all the patterns and colors. I took a few pictures today, and tonight I cropped this image out of one of them. Then I used Painter to posterize it. 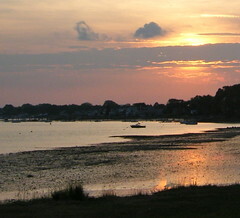 This is the last of a series of sunset photos that I took on August 18 at Obear Park, here in Beverly, MA. 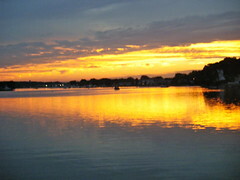 I was amazed when I saw the setting sun that day, and started taking pictures. The sky kept changing, so I kept photographing. If you want an idea of how fast the sky was changing, this photograph was taken at 7:57. To see what the sky looked like five minutes earlier, see the photo that I posted here yesterday. 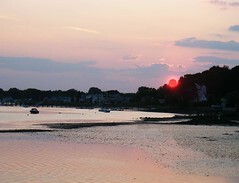 This is another photograph from the series of pictures I took on August 18 as the sun was setting. I was in Obear Park here in Beverly, MA. The sunset was amazing, so I started taking pictures. And the sky kept changing, so I kept shooting. This photo was taken at 7:52 PM; if you want to see how fast the sky was changing, compare to my post of August 21, which was also taken on August 18 at 7:50. Tonight I cropped the original image, and lightened the shadows just a bit because the exposure was overtaken by the strong light of the sunset. 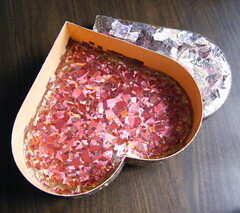 Yesterday I had a chance to work on this project for a while, a heart-shaped box that I am covering with collage and decoupage created from printed metallic ribbons. I am trying to finish the red interior, and at this point, am just filling in tiny gaps. It is very time consuming, takes forever to cut and fit the pieces, and progress is hard to see. So to add some motivation, I decided to start working on the next part of the project as well, which is the interior wall. I am using a pink and red pattern that has some green and blue in it, echoing the floral pattern on the top and bottom of the box. I started to cut and paste some squares in, just to see how it will look. I was happy with it, and even better, felt like I was making progress! You can see some of the squares in the photo, which is why I photographed the project from this angle. 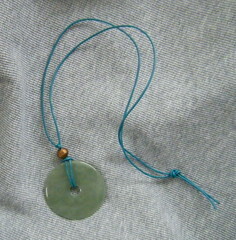 This is a pendant I made earlier this week, using some of my new jade, from China. I combined the large jade circle with an Ethiopian copper bead, and a piece of (dyed) turquoise leather. Although I wanted a simple design, it took a lot of tries to get this result. (Simple can take a while to achieve because every little decision counts.) Anyway, I am happy with this necklace. This afternoon, I photographed it (a process which presents its own challenges, if you ask me). So here it is. Here is another image from the set of sunset photos I took on August 18 at Obear Park. This one has been digitally edited. 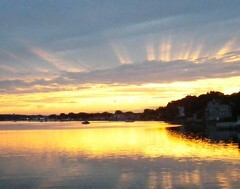 I liked the original image because it showed the reflections of the sunset in the water. But some silhouetted branches on the shore were spoiling the composition and partially obstructing the view. So I opened the image in Painter and used a digital airbrush and some cut and paste (and a little bit of posterizing) along the bottom edge of the photo to get the branches out of the way. Then I cropped the image to get this composition. This is another photograph from an evening walk at Obear Park on Wednesday night. Going to the park around sunset has become a bit of a routine this summer, because here in Beverly, MA, dogs aren't allowed in waterfront parks before 7:30. So lately I have seen some beautiful sunsets, which is a treat because around here, it is surprisingly difficult to get an unobstructed view of the Western sky. So on Wednesday night, I was prepared for a lovely view, but I was not prepared to be amazed! I started taking pictures right away, but it took a couple of tries to get the exposure right. This photo is just as it came out of the camera, apart from a bit of cropping. The light kept changing, so I took more photos, and I might use some of them as the basis for oil bar paintings. Day before yesterday I posted a digital sketch that I drew on my iPad with the Brushes app. (I was taking a 60 minute vacation, drawing from my imagination for an hour at Starbucks.) Tonight I am posting the "stroke-by-stroke" video that Brushes created as I drew. Just press play. Today I walked by some beautiful roses (planted in front of a little strip mall between the bank and Starbucks), so I stopped to look, and take a few pictures. 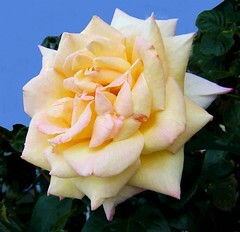 This rose is my favorite. Back home, I transferred th image into my computer and then used Painter's digital airbrush to simplify the background, and then posterized the image just a little bit. Now this looks like it belongs on a birthday cake! This is a drawing that I made tonight on my iPad using the Brushes app. Life has been a little crazy and very hectic this week. But tonight I had a chance to take a break, so I went to Starbucks for an hour. I wanted to get some practice in with Brushes. So I drew this scene from my imagination with no specific location in mind. Is it a mountain lake in Colorado? a beach in Brazil? the California coast? the beach in "Lost"? It doesn't matter, because the real vacation spot was Starbucks, drawing for an hour on my iPad. 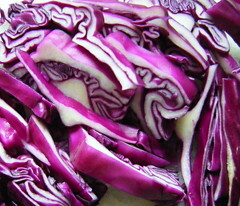 Yesterday I posted a photo of red cabbage. 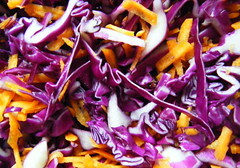 As I was slicing it up for cole slaw, I was admiring the colors and patterns, so I took a photo. I thought I was finished, but when I added the shredded carrots, I liked the colors even better, so I took one more photo. Tonight I cropped it to get this composition: a little abstract expressionism in the kitchen. This afternoon I was making cole slaw, so I sliced up some red cabbage. I caught myself admiring the colors and little curving lines, so I put down the knife and picked up my camera. After dinner, I used iPhoto to crop the original photo to get this composition. 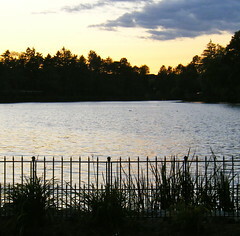 This is a photograph that I took last Monday (August 9) during an evening walk at Obear Park here in Beverly. It was around 8:20 and the sun had already gone below the horizon. But it wasn't too late to take a picture of the beautiful sky, so I did. Yesterday (Thursday) was the weekly pickup from The Food Project, a CSA (community supported agriculture) project. 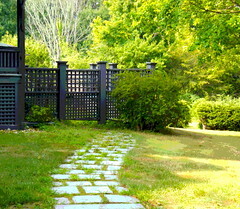 Here in Beverly, MA, it is located at Long Hill Gardens. Every week, those of us who signed up get to pick up a couple of big bags of organic vegetables. Usually all the vegetables are in big bins under a tent, but yesterday, people were allowed to pick their own cherry tomatoes and Swiss chard, so that is what I did. It was great! I felt like a kid on a field trip! 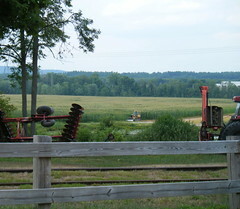 Since I had the chance to see the fields close up, I took a couple of photographs. Tonight I edited this one in iPhoto, retouching a bit to remove some distracting marks, and cropping it to get this composition. 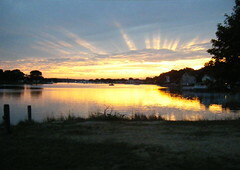 Yesterday I posted a photo of the sunset, taken from Obear Park here in Beverly, MA. I like the photograph, but was frustrated because my camera was unable to capture the bright red sun because the light was too strong. So today, I opened the image in Painter and used some color overlay and digital airbrush to restore the red color of the sun. (I took the color directly from the red that showed up in the photo around the edges of the sun.) This is the way the sun actually looked that night. So here is the question: is this image more or less true than the photo that came out of the camera? This is a photograph that I took on Sunday during a Cambridge run. A walk through campus was the shortest distance between a side-street parking space and Harvard Square (for restaurants, bookstores, etc.) 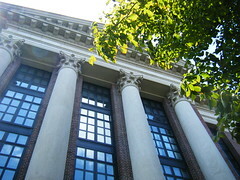 I looked up and saw the library from a new angle, so I took two photos. I like this one best, and this is exactly how it looked when it came out of the camera. 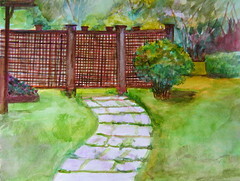 I started this watercolor last week at a plein air workshop that I attended with my cousin up in Concord, New Hampshire. Despite the fact that I only had two hours to paint, I chose a scene with lots of complicated patterns. 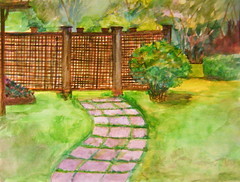 Yesterday I went back to the painting and worked on the lattice fence. Today I tackled the stone path, straightening the lines and fixing the perspective a bit. My goal was not to "correct" everything that I missed, but just to work with what I already had in the painting and resolve a few of the problems. I might do a little bit more with this painting, but it is watercolor, so what I can do is limited by the way this kind of paint behaves. Today I worked some more on the watercolor from last week's plein air workshop in Concord, NH. I liked the composition well enough that I am planning to do an oil bar painting from the reference photo. But meanwhile, I decided to return to the watercolor today and work on some of the problems that were bothering me. So I got out my travel watercolor set, and straightened out the lines of the fence, using a piece of cardboard as a straight-edge/T-square. Then I straightened and defined the lines of the lattice, having decided that if I wasn't happy with the lattice, I would never be happy with the painting. Then I worked on some of the spatial relationships that I wanted to fix (for example, the spatial relationship of the fence and the shrub in front of it). I worked from the painting itself, and not the reference photo, because I knew that to really make this painting look like the photo, I would have to start over, given the unforgiving quality of watercolor. So I will save all that for the oil bar painting. After working on this little watercolor today, I am happier with it. But there are still a few things I would like to fix. To be continued. . . . This is a photograph that I took on Tuesday in Concord, NH. We were leaving the Kimball-Jenkins School of Art, where I went to a plein air painting workshop with my cousin. 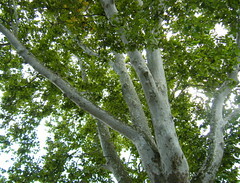 She likes this big sycamore tree, and I did too, so I took a picture. I agree with my cousin that it really is impossible to capture the scale of this big tree in a photo, but I did the best I could. 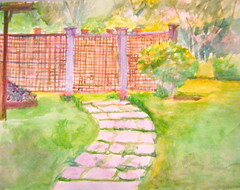 On Tuesday, I went to a plein air painting workshop in Concord, NH, and did a little watercolor painting of this scene, a lattice fence and stone walkway at the Kimball-Jenkins School of Art. I posted my painting here on Tuesday, and yesterday I posted the reference photo that I took of the scene after I finished painting. But I decided that I liked the photo for its own sake, and tonight decided to see what I could do with it. I started by increasing the saturation in iPhoto. Then I opened the image in Painter and used cut and paste to replace three big plastic bags of mulch with some foliage. I also used a combination of cut-and-paste and digital pastel to eliminate some stray pieces of wood, flower-pots, and other items that were distractions from the main composition. (I even covered up some folding chairs that were visible through the lattice fence.) 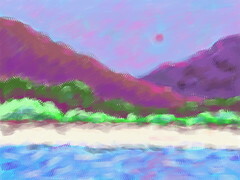 Then I used a little bit of digital pastel to make the grass just a tiny bit greener. I also put a very gentle green color overlay over the branches of the dead tree in the background. The last thing I did was to posterized the whole image, using trial and error to find just the right level. Last night I posted a little watercolor painting that I did yesterday in a plein air workshop in Concord, NH. After I painted for two hours, the workshop was over, and it was time to stop. But before I packed up all my gear, I took a photo of what I had been trying to paint. (Although I thought at the time that the painting was finished, today I think I may want to return to it and do more at some point.) In any case, it is always a good idea to have a photo. When I compare this photo to my painting, of course I see things I want to change in the painting to make it a more accurate representation. But I can also see quite clearly in this photo why I chose this scene and what I was trying to capture in the painting: the composition, the patterns, the light, and the garden in the distance. I can also see the potential of this photo in its own right, apart from being a reference for a painting. But I might want to edit it just a little bit. To be continued. . . . This is a little watercolor painting that I did today in a plein air painting class. (The idea of plein air is just to paint outside, from observation.) My cousin is taking a three-day workshop at the Kimball-Jenkins School of Art in Concord, NH, and invited me to sign up as well. As it turned out, I could only take the class for one day, and today was the day. So this morning I drove up to Concord with art supplies in the back seat. This is a path and garden attached to one of the administrative buildings on the Kimball-Jenkins Estate, where the classes are held. I was interested in the patterns of the lattice fence and the stone walk, so I chose this as my subject matter even though (especially because) I knew the fence and path would be challenging. I was certainly right about that! I wanted a "painting work-out" and I certainly got one, trying to paint this in two hours, especially using my tiny little travel watercolor set. When I was finished painting, I took a reference photo of the scene, and I plan to post it here tomorrow. This is a stroke-by-stroke video of a digital drawing of Porto. I created the drawing last month with the Brushes app on my iPad. (Original and revised versions posted here on June 21 and 23). At the time, I didn't know how to export and post the digital videos. But now I do, so here it is, inspired by memories of visits to Portugal. Vamos la! Just press play. 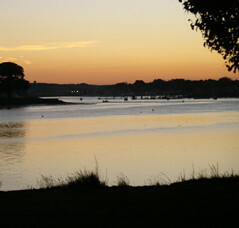 This is another photograph taken at Obear Park here in Beverly, MA. We went for an evening walk last Wednesday, and the tide was out. It was getting close to 8 PM when I took this photo. Once I got home, I used iPhoto to adjust and crop the photo to get this composition. I tried making the shadows lighter, but decided that I liked the effect of a silhouette that the darker shadows created.